Our current thinking and feeling about the future – how we are currently relating to the future – has to somehow factor into the question of how we can better engage with the future. And once we start thinking about our relationship with the future, it quickly becomes evident how much our present and our past influence this relationship. 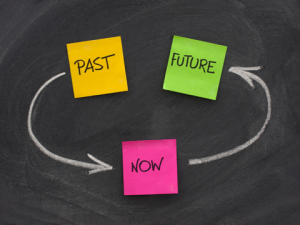 So we really need to think how we relate to all three time perspectives: past, present, and future. We live simultaneously in all three times, and we cannot really separate the future from this ongoing, continuously unfolding time line. We are living in a present that is shaped by the past, and we are constantly shaping our future from this present. Our future is emerging day by day, from our present, as shaped by our past. And as nicely stated in the quote above, a concern for the future then has to also include attention to the past and the present. So what is the essence of our relationship to the past and the present? And how might we want to look at these relationships as part of our future smart exploration? What might we gain from this? Our fundamental mental activity with regards to the past is “to remember”. No matter what our emotional response to the past – regret, nostalgia, gratitude, guilt – our relationship to the past is always based on the fundamental activity of remembering what came before. We can think of the history as a field of study as our collective “remembering” of what came before. The formal discipline of history – History with a capital “H” – covers all aspects of our world: physical, natural, political and social and more. Then there is also our personal history – our own personal past that got us to here, to now. This “smaller” personal history that is uniquely ours fits into the context of the larger history of our world. Remembering the past is not a neutral act. In our personal history, for sure, it is a narrative, a story, we construct. This story will be selective; it can demonize or idealize past events; we can honour the past or judge the past. It can be the source of emotional pain or the source of gratitude. We can make sense of the past, or we can struggle to understand it. We can learn from it to make better choices and decision today; we can repeat mistakes from the past; we can be misguided in our choices today and tomorrow based on our past experiences. What is clear, though, is that how we tell the story of the past shapes our present. When we expand our scope to look beyond our immediate personal history to the larger historical context that shaped us – political, social, organizational, and more – the extent to which our present is shaped by our past becomes even more apparent. Our understanding of the past is part of the context in which we make sense of our present as well as our expectations, hopes and fears for the future. This is true for our personal history, as well as for our broader historical context. Here are three ways in which we might use knowledge of the past as a way to inform your engagement with the future. 1. Consider first the larger historical context in which we live and work. A future smart focus would include being more curious about what “got us here” – in whatever domain is important to us. This is about cultivating a historical sense with an eye to the present and the future – an eye to what is now emerging from the past. Just consider some of the big issues that are affecting us all: Climate change, the rise in religious extremism, the refugee crisis … Or consider a more localized personal issue for you – a business challenge, traffic congestion in your city, even a family issue. How did things come to be the way they are? What are the forces that are at play, and what feeds them? What are some of the dynamics at play that you need to consider as you chart a way forward? This kind of “remembering” and sense-making of the past is about recognizing that history is a source of information, perspective and insight that can be useful to us as we step forward into the future. Such knowledge and insight does not determine our path; it does not tell us what to do or what not to do. But it could give us new insight into the context in which we’re choosing and charting a way forward into the future, highlighting forces and leverage points that we might be wise to consider. 2. As for your personal history: Constructing a simple “story of your life so far” can be very instructive in terms of revealing to you your life narrative. This in a reflection I often ask coaching clients to do at the start of the coaching process, and it often provides insights that significantly impact the client’s path forward. What are the main factors that helped shape who you are? Who were the influential people who helped shape you? What are your proudest accomplishments? What are your greatest regrets and disappointments? What are the key choices you made in life that determine who you are and where you are now? What motivated those choices? What are the main events that were out of your control, and that had a significant role in determining who and where you are today? This kind of reflection often provides great insight into the shape of our present reality and our current identity. It can generate deep gratitude and appreciation for the people and events that got us here, as well as sadness about missed opportunities. We notice how the story of the past can be told in different ways, with different meanings – that there are “facts” of our life as well as different ways to make meaning of these facts. This “sense-making” process relates to one of the key forms on integration distinguished by Daniel Siegel in his mindsight model: integration across time. Crafting a story of our life so far often also reveals how some of these “past” elements are still dynamically at work, continuing to shape the present and hence influence our future. Seeing these dynamics more clearly “from a distance” gives us the opportunity to step back and consider what we really want to have happen – what we want to maintain, what to change, and what to let go of. In short, it helps is make more intentional choices for shaping our future. 3. Crafting your own personal history also offers an opportunity for playing the “chose your own alternative adventure” game with your own life story. Remember those “chose your own adventure” books for kids – books in which at various points in the storyline you could make certain choices for the characters and then see how that choice might play out in the story line? Well, imagine that you made some different choices at key points along the way of your life? Or that a significant big event that happened to you did not happen – or the other way round? Use your imagination to craft a viable and interesting alternative story for yourself – a different and fun adventure. Note that this is not about regretting or “remaking” your life or healing past hurts or judging what path might have been the better one. Rather, it is simply about seeing that viable and interesting alternatives were always possible for us. This kind of “remembering a new story ” through the use of imagination is a way of prying ourselves a bit looser from what sometimes feels like the “inevitability” of who we are and the current shape of our life. It can help give us a deeper sense of some of the other possibilities that were always present in your story. Most important, this form of re-crafting our life story is a way to practice a mental capability that we will need in spades as we meet the future: the capability to “re-imagine what’s possible” for us as we engage with the fast moving future. If we are too tightly caught in one way of seeing who we are, in one story of what our life and or career is all about, we will be more challenged to flex and adapt than if we were more open to different possibilities. Playing in a fun way with our life story offers us an interesting way to practice this mindset of crafting and mentally inhabiting different personal possibilities.